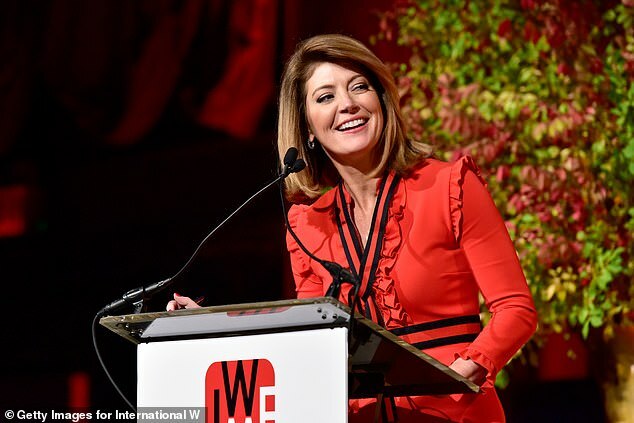 CBS This Morning host Norah O’Donnell is recovering after undergoing an emergency appendectomy. 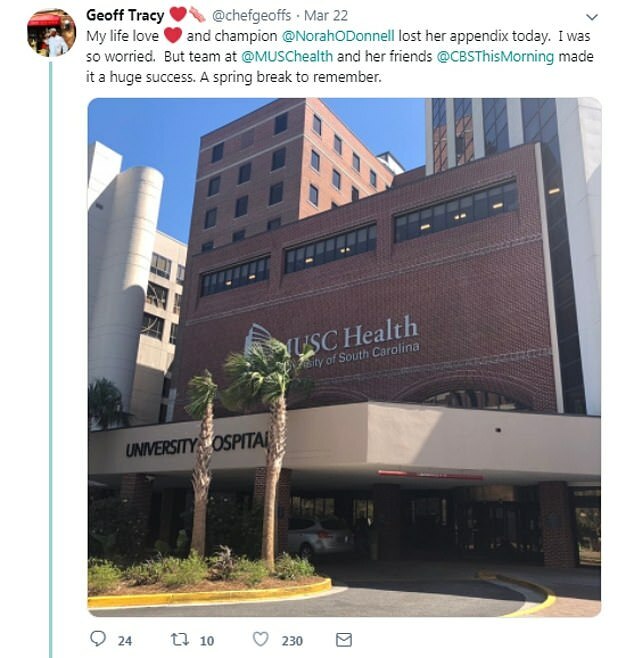 The 45-year-old shared a photo on Instagram from her hospital room at the Medical University of South Carolina in Charleston giving a thumbs up and thanking fans for their well-wishes. ‘I am feeling much better and hope to return to NYC later this week if I feel well enough to fly,’ the mother-of-three wrote in the caption. In the post, which has more than 9,000 likes, O’Donnell urged her followers to listen to their bodies. ‘If you are in pain, see a doctor. Don’t wait [five] days like I did ignoring pain,’ she wrote. 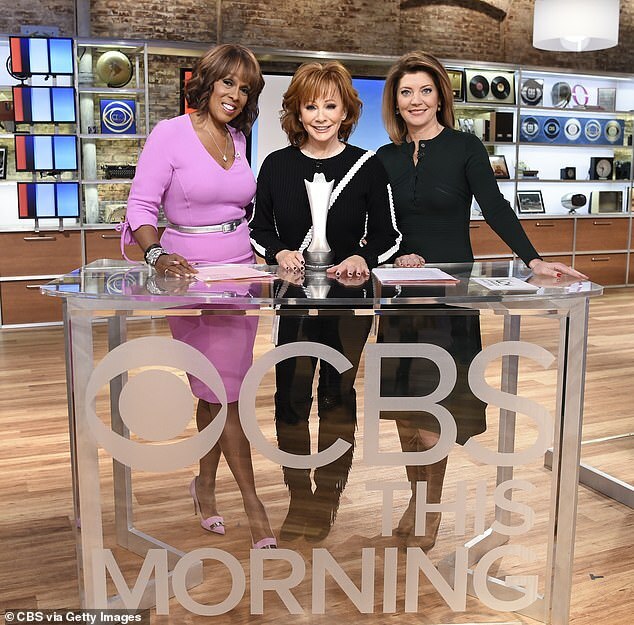 O’Donnell was vacationing with her husband, chef Geoff Tracy, in South Carolina when she was rushed to the hospital on Friday. 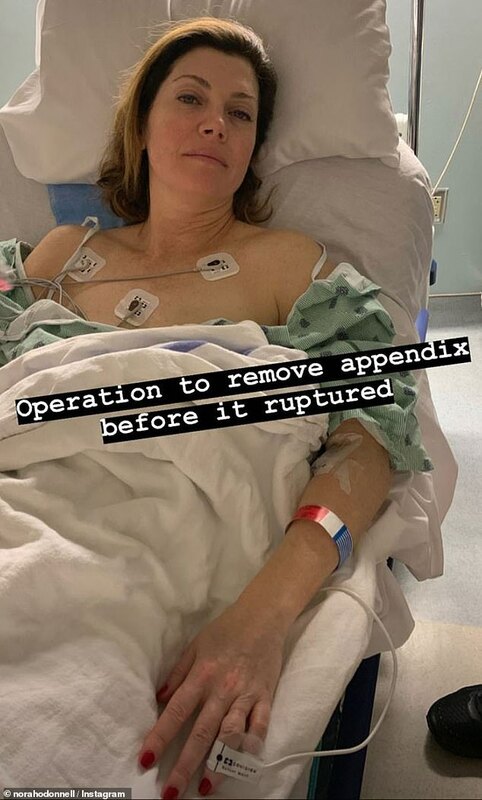 She shared a photo to her Instagram story where she revealed she had appendicitis. This is an inflammation of the appendix, a finger-like pouch located where the small and large intestines join on the lower right side of the abdomen. 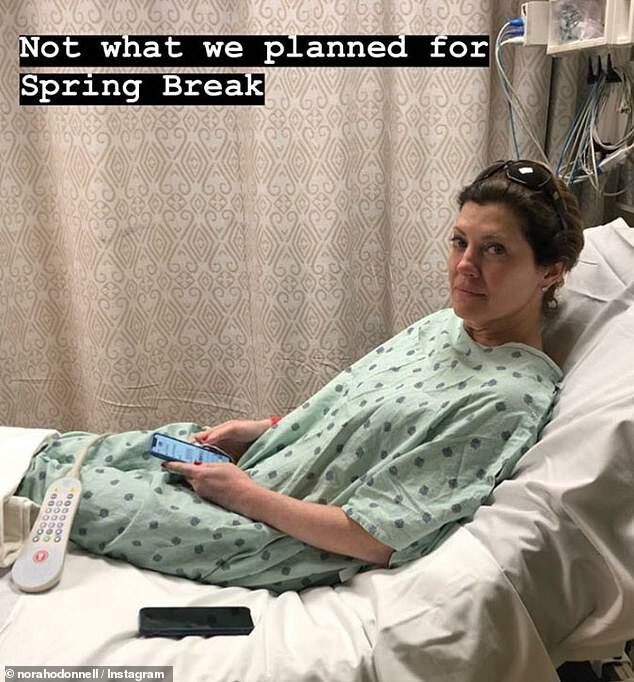 In the photo, O’Donnell is seen wearing a hospital gown in a bed with the caption: ‘Not what we planned for spring break’. She then shared a video from the point-of-view of her gurney with the caption: ‘Heading to surgery’. 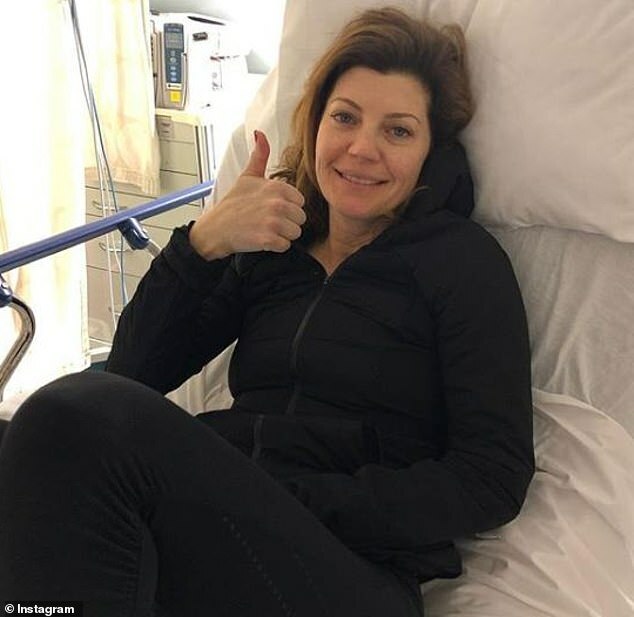 A hospital spokeswoman confirmed to DailyMail.com that the TV host had surgery on Friday and that she was discharged later in the day. Signs of appendicitis usually include pain the lower right side of the abdomen, pain around the belly button, nausea, vomiting, fever and diarrhea. According to Dr Jonathan Kohler, an assistant professor of surgery and pediatrics at UW-Madison, around seven percent of people will develop the condition at some point in their lives. He told DailyMail.com that even though it’s one of the most common diseases seen in hospital, it’s not understood very well. ‘We can’t predict who will get it, we don’t know enough about the microorganisms involved,’ he said. Dr Kohler said that there is a misconception that once the appendix is inflamed it’s like a balloon that gets bigger and bigger until it pops. However, he warns that there are risks of not having surgery if you have a severe case of appendicitis. There are two types of surgery for removing the appendix. The first is an open appendectomy, which involves making a two-to-four inch incision in the lower right abdomen to remove the appendix. The second is a laparoscopic appendectomy, which is the type that O’Donnell had performed on her. It involves making one to three tiny incisions. A laparoscope, a thin tube with a video camera and surgical tools, is inserted in one of the incisions and the surgeon uses a TV monitor to guide the tube and remove the appendix. Most patients go home the same day as the surgery. Some studies have suggested using antibiotics as a first course of treatment for appendicitis rather than surgery. However, Dr Joaquin Havens, a surgeon with the Trauma, Burn and Surgical Care group at Brigham and Women’s Hospital in Boston, Massachusetts, says patients have a 40 percent chance of recurrence in five years. ‘With those chances, the recommendation is to surgically remove the appendix,’ he told DailyMail.com. Both doctors urged that any patient who is experiencing persistent stomach pain should seek immediate medical attention. ‘If you have unremitting abdominal pain, meaning it’s not getting better, typically if it’s accompanied by fever, nausea or diarrhea, get it checked out,’ Dr Kohler said. Is Nike up next in college basketball probe?